From the creators of the sell-out hit Buzz: A New Musical. Bryony Buckle is astoundingly average. Her days are filled with mind-numbing office work, thinking about lunch and lusting after Orson Bloom from IT. 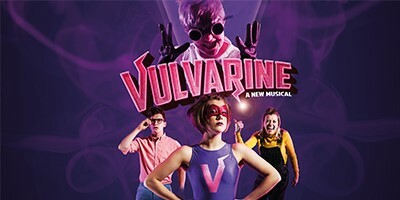 But following a dose of hormone therapy gone wrong and a well-timed bolt of lightning, Bryony gains superhero abilities and a brand-new persona: Vulvarine, saviour of womankind. Where is all the tampon tax going? Who is The Mansplainer and what is his evil plan? Grab your tights, your spanx and your most supportive sports bra. It's hero time. Fat Rascal Theatre was set up in 2016 by a group of East 15 graduates. Since then we have quickly established ourselves as a home for new musical theatre, having produced 5 brand-new musicals in the space of two years. We are a company run by women; we challenge the constraints of being a female within the industry, and discuss social and political issues through an accessible and appealing format to engage a wider audience. We have so far won the Otherplace/Balkan Award at Brighton Fringe, VAULT festival’s Festival Spirit Award, an Eddies Award, Fairy Powered Productions’ Best New Writing Award and the Stella Wilkie Award from the King’s Head Theatre, alongside garnering an Edinburgh Fringe Sellout Laurel. We were nominated for the Les Enfants Terribles Award in both 2016 and 2017 and received an Off West End Award nomination for our production of Beauty and the Beast: A Musical Parody.